Contrary to general belief, scientists have many passions. These are mine. in particular concerning what we can know (epistemology), what we experience (phenomenology) and what is (ontology). I’m also interesed in the history of ideas, and the relationship between science and religion (click here for a list of books I’ve just read). As I was raised in a devout Roman Catholic family, this last question continues to occupy quite a bit of my time. Download this unpublished essay for my thoughts on these matters. Hiking in the magical Needles, in the southern part of the Sierra Nevada, we came upon this mothership of all Giant Sequoia trees estimated to be at least 1,500 years old. 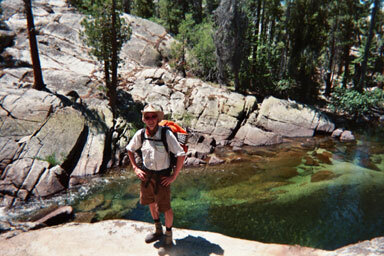 In July of 2007, I went on a 7 days solitary hike along the John Muir Trail in the Sierra Nevada. I walked a total of 120 miles, between 8,000 and 12,000 feet. It was pretty minimal in terms of equipment (no cell phone, no watch, no tent; just a sleeping and a bivy bag, a foam pad, a small stove, and enough food for one week). Here you can see where I slept on the first night. The weather was perfect. At night, I would contemplate the high alpine sky above me and the moral compass within me. I undertook this trip to come to some sort of conclusion concerning the problem of freedom of action. I deliberately decided that it is sensible, and perfectly rational, to believe in a libertarian conception of free will (more on this in the book I’m currently writing). Here is the spectacular view from my sleeping place on the 5. morning. I returned home when I couldn’t take the solitude anymore. Most people don’t realize, but Los Angeles is not only bordered by the Pacific Ocean, but on the northern edge by the San Gabriel Mountains. While I live and work in Pasadena at an altitude of 800 feet or so, Mount Wilson – just behind my house – peaks at 5,710 feet. A bit farther away is Mount Baldy (San Antonio; 10,064 feet), Mount San Jacinto (10,670 feet) and San Gorgonio (11,499 feet). As a comparison, the tallest mountain in Germany, the Zugspitze, is 9,718 feet tall. I run every couple of weeks from my home to the top of Mount Wilson and back. In June 2010, I bought one of these nifty watches with a GPS receiver and a heart-rate meter. Pretty amazing technology. Here you see my data for a typical Mt. Wilson run. I drove to the top of Allen Avenue in the first ten minutes (time is in units of sec), parked and ran down to the bottom of Eaton Canyon (see the first kink) and then, in another 2 hrs and 10 min to the top of the mountain. Not surprisingly, I took less time to descend back to Pasadena (it’s 8.5 miles one way). My heart-rate averaged around 140, maxing at 160 bpm. Sometimes there is snow on top of Mt. Wilson and you can see Catalina Island – more than 50 miles away – and the Pacific; and all of that under a deep blue sky dome. Where else but in Southern Cal! With my good friend and colleague Ralph Adolphs, we ran and hiked the Cactus to Clouds trail on 11/11/07. We started in Palm Springs around 600 feet and ended up 5 hours and 20 minutes later at the San Jacinto cable car station at 8,600 feet. See us on the non-maintained and not marked trail in the desert The weather was perfect – warm under a blue sky for the first few hours. Later on, some clouds came up; by the time we reached the top it became quite cool and windy. We actually only ran the bottom 2/3; when the trail became to steep and rocky and we became tired, we fast walked. Running this skyline trail is no mere feat – around 9 miles and 8,000 feet elevation gain – on 2 liters of water, some Gu and cheese and a small backpack. And no pain except for some minor lactic acid buildup, aka burn, in my calf muscles. Ralph and I typically run every couple of weeks for 3-5 hours in the mountains. 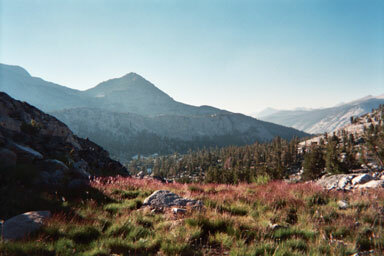 On 4/26/09 we blasted our way from Manker Flats at 6,100 feet to the Ski Hut at 8,200′ in 54 min. Then on to the Devil’s backbone by scrambling up behind the Sierra Hut. It was sooooo beautiful, with clear spring air, perfect blue skies, spectacular views of the Los Angeles basis and pounding hearts. Oh Lord, when the times come, let me be on a trail such as this one, high above good and evil, and not return. Around 9,500 feet we hit the ridge and the winds became so fierce and frigid that we had to turn back, seeking the lee side of the mountain and descending to the ski restaurant at the Mt. Baldy Notch for our, by now, traditional beer and beans and a run back to the car. Ralph – what is the mantra: take a wind shell! Running marathons is good discipline! I ran my first one in 2004 in 3:58:15 in Los Angeles. I liked the experience so much that I ran my second in 2005 (in 3:44:02), my third in 2006 (in 3:41:03) and my fourth LA Marathon in 2007 (in 3:41:39). I probably should’ve trained more (my training involved running the previous three weekends with Ralph to the top of Mt Wilson and thereabouts). This will be the last one I’m running with a specific time goal. It is much more enjoyable to run for fun, i.e. 1-2 minutes per mile slower than possible, have a lot less joint pain and recover faster. On my first ultra-marathon (50 km distance and 8,000 feet of elevation) in the San Gabriel Mountains I suffered dearly, as both legs were fully exposed to poison-oak, an interesting but – on the whole rather painful – experience. Other running events in 2006 include a 24 hour relay run over 181 miles, KELROF, with members of Klab, and a jog up from Mount Baldy Village (4,260 feet) to Mount Baldy (10,064 feet) with Stephen Waydo in 2-3/4 hours up and 2 hours down. From up high, there are some spectacular views. After a three year hiatus, I participated in the Death Valley Marathon in February of 2010 on a lark. Without training, it took me an abysmal 4:20:26 to finish. The race itself was easy, on gravel roads that were utterly flat, under grey skies (and a sprinkling of rain; and that in Death Valley!). We ran through Bad Waters, the lowest elevation in the Americas. The vast views of the desert and the distant mountains were spectacular. Only about 200 people participated. I ran with my good friend Shihab Shamma and without a wristwatch, something I can highly recommend. It definitely enhances the race experience and the next day you feel like a young hero. After spending three months in East Asian – primary in Seoul, South Korea – where everywhere you go, there is a crowd, including the top of mountains, I yearned for big, open spaces. Thus, I signed up for the second time this year for the Death Valley Marathon. On December 4. 2009, three people from the laboratory and myself ran the race: Xiaodi Hou (his first Marathon), Fatma Imamoglu (her first Half-Marathon) and McKell Carter. The race course started in Nevada around 3,600 feet, took us up to 5,200 feet and the, down through Titus Canyon, to almost sealevel. An intense experience. And I discovered the Zen of Marathon running. Take off the watch (or any other timing device), take a camera along and have some fun. Running is fun – in particular in the mountains – but is not to be taken too seriously. It is also not as profoundly engaging and addictive as climbing – more on that next. Climbing mountains, towers and big walls. I started to climb in 2001 – when our children left for college, leaving a huge emotional hole in our lives. I miss them more than words can say…So I climb. That’s me doing a Tyrolean Traverse between Lost Arrow Spire and the Canyon rim, 2800 feet above the floor of Yosemite Valley; this picture was taken by Katie Sheehan. You ask me why I climb? Jon Krakauer expresses it quite well “By and by, your attention becomes so intensely focused that you no longer notice the raw knuckles, the cramping thighs, the strain of maintaining nonstop concentration. A trance-like state settles over your efforts, the climb becomes a clear-eyed dream. The accrued guilt and clutter of day-to-day existence, all of it is temporarily forgotten, crowded from your thoughts by an overpowering clarity of purpose, and by the seriousness of the task at hand.” I get out as often as my schedule let’s me; my regular climbing partners are Kai Zinn, Grant Horner, Bob Yoho and Reid Malinbaum, a very cool and motley crew of interesting characters. As you end up spending a lot of time together when climbing and hiking, it is important that you share plenty of intellectual interests. This is Bob on the Vampire in Taquitz, an alpine climbing area two hours from here. In 2004, I climbed Halfdome in Yosemite Valley the hard way in three days. I do love the lonely and exposed peaks in the High Sierra. 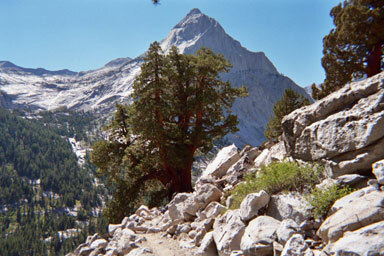 Grant Horner and I climbed Lone Pine Peak in 2005 and Bear Creek Spire (see below) in 2006.